The intimate event bringing successful app entrepreneurs together to build lasting relationships. This is like no other event you’ve ever experienced. You will walk away with more meaningful connections and actionable, personal advice to help you grow your app business. Connect with industry thought leaders, successful app entrepreneurs and discover new tools to grow your app business. Creator of #1 world wide hit Color Switch. Mobile Economist at TUNE. Contributor to Forbes, Venture Beat and Business Insider. Forget all the boring presentations with info that you can Google. We bring action-packed content through accomplished speakers, mentor round tables, and attendee introductions. With our format, you will get advice specific to your needs. *Attendee Introductions: Each attendee will have 3 minutes to introduce themselves and teach the rest of the group something. This will happen throughout the day. Make meaningful connections with other 6 and 7-figure app entrepreneurs at an event like nothing other. Why should we leave it up to networking parties, random seating or luncheons to make the connections that will allow us to grow? The entire retreat is centered around making meaningful connections that will last years past the conference not just swapping business cards. *Mastermind sessions will include getting feedback on your business from the rest of the table. Everyone will have a chance to get into the “hot seat”. The biggest breakthroughs come when we work on our business not in our business. Through the entire two days you will be surrounded by the knowledge and people to help you get to the next level. And more importantly, your knowledge can also help others. *Each person will be able to GIVE and RECEIVE advice, so that we can all grow our businesses collectively. AppMasters is a conference unlike any I’ve ever attended. Virtually all of the attendees are successful mobile entrepreneurs with tens or hundreds of millions of app installs. The best part was day two: roundtables with five to eight people, in which each person had a chance to explain their business and get insight from all the other experts around the table. 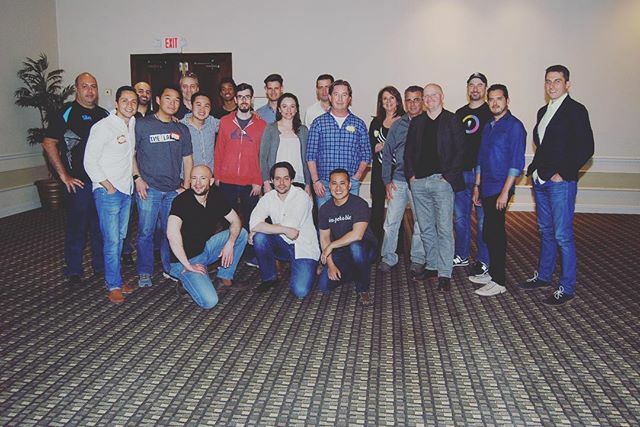 Everyone learned a ton, and I know for a fact that many of the attendees got insights that fundamentally changed their businesses, putting them on a trajectory for even more success. Past Speaker, Mobile Economist at TUNE. Contributor to Forbes, Venture Beat and Business Insider. App Masters Connect was uniquely small and powerfully connecting, giving us all the opportunity to brainstorm and dive deep with successful app developers and service providers. I made industry connections and established relationships that will have a profound impact on me and my business for many years to come. AppMasters is not another conference. It’s an intimate event where not only the content is carefully curated, but also the attendees! Steve creates a dynamic where you get to connect with, and tap the minds of, leading app entrepreneurs and experts who are experiencing (or have experienced) similar challenges as you are and have immense insight and expertise to share. Just as valuable, you get to observe their businesses, help, and gain satisfaction and wider perspective as a result. Steve is relentless in ensuring everyone gets amazing value and I seriously highly recommend it! I made more connections at App Masters Connect than I did at Mobile World Congress. Steve has done a great job of bringing together successful app entrepreneurs and making sure they connect. Join us for the most immersive event that will lead to new breakthroughs for your app business. See what’s working in the app business from people making it in the app business. Get downloadable access to all the presentations, videos and resources presented at the event. We will have a catered lunch on both days and a cocktail hour on day 2 of the event. Get feedback from app entrepreneurs on how you can grow downloads, increase sales, and much more. Each attendee will share their story and super power so we can connect with the right people. Get access to an Escape Room adventure & speed networking so you can meet and support each attendee.